The remote Toroweap Overlook in the western part of the Grand Canyon offers adventurous visitors one of the canyon's most fantastic vistas (photo, left). From an unfenced ledge, you can view the Colorado River 3,000 feet straight below! The famous Lava Falls Rapid, considered the canyon's biggest challenge for white water rafters, is just downriver and can easily be seen and heard from the overlook. This area has been volcanically active for several million years, and remnants of this activity are quite visible. Vulcan's Throne (photo, right) just west of the overlook is one of the most interesting examples, as is Mt. Trumbull, the flat-top mountain which is the tallest feature in the area. Lava has flowed into the canyon numerous times, damming the Colorado River and creating a huge lake. In time, the river always erodes the lava and frees itself. The river is presently fifty feet below the level of the most recent dam. Evidence is clearly visible west of the overlook. The black lava flow remnants contrast with the red canyon walls of the Hermit Shale and Supai sandstones to the east. There is a short but exremely steep trail from the rim to Lava Falls Rapid. This secondary trail is rocky and shadeless and should be attempted by experienced hikers only. A permit is required. There is a ranger station about five miles north of the overlook but it's not always open. There is a small, primitive campground - no water - close by the overlook. It is not suitable for RVs or trailers. A high clearance vehicle or four-wheel drive is preferable for this trip. Consult a ranger before making the trip. Ranger stations with regular hours are available at the North Rim, Jacob Lake, Pipe Springs National Monument, and St. George. Travel Directions and Road Conditions. The area is served by a network of dirt roads on BLM land. There are numerous secondary roads but you should be able to follow the roads indicated on the map at left. Just stay on the main-looking roads - they are fairly well-maintained and wide. However there will still be plenty of washboarding and dust. The roads are not passable when they're wet or snow-covered, and shouldn't be attempted then even with four-wheel drive. The last three miles before the campground are on slickrock and pretty rough. You should have at least a high-clearance vehicle. It may be difficult getting help in this area. It is advisable to carry emergency supplies (water, food, tool kit, good spare tire. etc.). The shortest route to Toroweap from a paved highway is about 60 miles each way on dirt road. Allow two to three hours driving time. The easiest and most traveled route leaves Arizona-389 about seven miles west of Fredonia, near Pipe Springs National Monument. It is the Mt. Trumbull Road (BLM-109, "Sunshine Route"), and fairly well-marked. You will eventually see Mt. Trumbull in the distance, an obvious landmark. About five miles before reaching the mountain, you reach a major intersection. Clayhole Road (BLM-5) comes in from the right (north). (The road is a good route back to Arizona-389 near Colorado City - useful if you are heading west when done.) In about eight miles, there is a second major intersection. The Mt. Trumbull Road (now BLM-5) bears right (west) and goes around the south side of the mountain. Bear left onto the Toroweap Road which should be well marked. It is about ten more miles or so to the campground. The area to the northwest of Toroweap is designated as the Grand Canyon Parashant National Monument. The monument has four designated wildneress areas, including the Mt. Trumbull Wilderness. This exceedingly remote area is very unspoiled, rich in wildlife, and very lightly visited. There are no campgrounds or services, few designated trails, and few roads. It is an excellent opportunitiy for adventurous, self-sufficient visitors looking for a wilderness-type experience. The main route through the area is the Mt. Trumbull Road (BLM-5) which skirts the south side of Mt. Trumbull, then runs ten miles west to Quail Hill Road (BLM-1069, Main Street Valley Route). This long, dusty route runs north through Main Street Valley, eventually reaching St. George, Utah. It is about 90 miles from Toroweap to St. George on this route. A fairly convenient way to experience the area is to take the short but steep hike to the top of Mt. Trumbull. The mountain which is really a flat-top mesa is the tallest in the area, reaching a height of 8,028 feet. The slopes are covered with juniper and pinyon but there are ponderosa pines on the top. Good views at the top and the potential to see wildlife. The trailhead is on the Mt. Trumbull Road (BLM-5) a few miles west of the Toroweap Road intersection. The mountain and the road can become snow-covered and impassible during the winter. National Park Service - Tuweep. 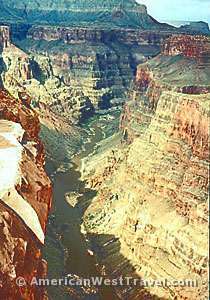 National Park Service - Grand Canyon Parashant. Grand Canyon Parashant - Best Maps of Area. Bureau of Land Management - Grand Canyon Parashant.